We certainly hope that back to school does not mean back to bullying! Unfortunately, being bullied at school is the reality for too many children. Kids will have conflicts with each other. They will tease and sometimes be rude or mean to others. While some behavior may be inappropriate, bullying goes beyond this. Imbalance of Power: People who bully use their power to control or harm. The people being bullied may have a hard time defending themselves. Kids may have more power due to things like age, physical size or popularity. Intent to Cause Harm: Actions done by accident are not bullying. The person bullying has a goal to cause harm. If your children have bullied someone, it's important to help them build skills so that they find better ways of acting in the future. Punishing them by grounding them or taking away privileges may only encourage them to find ways to avoid being caught in the future. What will you do differently next time so this doesn't happen again? What type of amends do you think you should make? How will you reconcile with the person you've hurt? Struggling to answer these tough questions can help kids learn from their poor choices. While they may be tempted to blame others for their actions, the goal is for them to realize their own role in the situation and take responsibility for the results of their actions. Children who bully often have been bullied themselves. One divorced mom told me how her 12-year-old son was beaten by his dad one day. The following week she received three calls from the school regarding her son bullying other kids. Since he had previously never been involved in any bullying activity, she connected it to his recent experience with his dad. She helped him find better ways to respond. If your children come to you distraught because of being bullied, listen and show compassion. Work to understand their perspective on the situation without immediately trying to solve it. Make sure your children receive the message that you love them, believe them and understand their feelings. Most children who are being bullied do not tell their parents. If you notice your child hasn't wanted to go to school lately or is exhibiting other behavior that has you concerned, bring it up. You might say something like "I noticed that you haven't wanted to go to school lately. What's going on?" Keep asking questions until you feel you really understand. Help your child think through ways of getting away from the bully. Roleplay how to calmly tell the bully to stop. Explore ways to engage with other kids away from the bully. Meet with your child's teachers or counselor. Develop a plan for keeping your child safe, particularly during vulnerable times like lunch, recess and going to and from school. Contact police or school resource officer if the actions are criminal. The Stop Bullying site has many helpful ideas for both kids and parents. 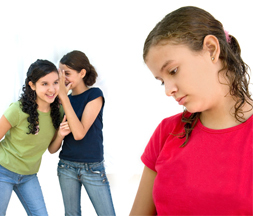 Children who watch another child get bullied are also affected by the bullying. They may feel guilty for not intervening on behalf of the victim. They may be afraid to act or not sure what to do. Help your children think through these situations and feel empathy for the victim. Discuss appropriate ways to support the victim. Developing the courage to stand up for victims isn't easy. Simple actions like moving closer to stand next to the victim can help. You play an important role in guiding your children to treat everyone with respect and dignity. Teaching children these moral values will help reduce bullying.